I had come full circle. I first digitally chased Mary Ann Hill Davy Symons through Ancestry.com and via email exchanges with always-helpful Cornish Parish clerks. I then made the physical journey across the ocean to her homeland and tramped through her towns: St. Ive, Menheniot, St. Germans, and Liskeard Cornwall. In a fitting setting, I had stood in the rain at Castle Garden where she first landed in the United States. I peered into her life in Vershire/Ely Vermont. I knew where her monument marked the place of her burial in the Ishpeming, Michigan Cemetery. I had found a child that no living relative knew had existed. I solved the mystery of Mary Ann and Mary Jane and in that solution gained a clearer understanding of the ways of Victorian England. Here and there the unexpected disappointments resulted in my greater understanding of Mary Ann, her circumstances, and ultimately of me. And I felt very lucky. My great great great grandmother had survived whatever horrible illnesses had swept through Liskeard in 1868. She had made fateful decisions that affected me. The “what ifs” haunted me for a while, but later I came to terms with the ways of the universe. I studied the gold gilded framed photo of her daughter Harriett and family in my living room and considered how lucky I was to have it and to know the approximate date of the picture and the identity of these somber faces. I felt content. Now, I merely had to write Mary Ann’s story and then move on to another branch of my family tree. In that offhanded way my mother has of providing valuable information, she mentioned that she had an early photo of the house where she had lived with her parents and grandparents. 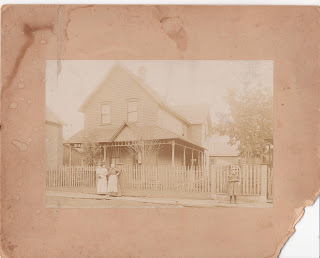 When she pulled the faded sepia photo with its missing corner from her plastic bin, I felt tingles. For my mother this was a photo of her house. For me, this was a photo of people. Women stood in front of this home! I stared at the heavyset older woman wearing the white apron, her arm on her hip, in a determined pose. She stared back. Yes, she was of the age Mary Ann would have been between 1897 and 1900 when the photo was taken. Had she lived in this house then? My mother could only tell me that her father had purchased the house from his in-laws, the Simons’ family. It was a step in the right direction. Could I dare hope I was finally, after all this time, looking at Mary Ann? While I could say that my training required more proof, in reality because I had trailed Mary Ann for so long and made a multitude of errors, I feared I would misidentify her. Perhaps at this point, it was my emotions that pushed me further. My gold gilded photo had been dated between 1897-1900. While I knew Mary Ann lived at 120 E. Superior Street in 1900, had she lived here in 1897? I would not be satisfied without this information. I reasoned that a trip back to the Marquette County Historical Society would allow me to examine city directories from these years. I just had to be patient. Several weeks later, I again logged onto Ancestry.com, thinking it was time to turn my attention to the Sundbergs. Why not? It might lead to a Swedish excursion! To my surprise, when searching for Frank Sundberg, an Ishpeming City Directory for 1897 popped up. This was new or I hadn’t seen these directories before. Almost forgetting my obsession with Mary Ann’s residence, I examined the Sundberg list of addresses. But at that moment, an unexpected stillness settled on the house. The steady hum of the refrigerator seemed to stop; the soft air warming the house stood still. Even the moaning of the sleeping dogs ceased. Ostensibly from out of nowhere, there came an unexpected sound. I couldn’t quite place it; a gentle click repeated itself over and over, a background noise that in a strange conflux belonged to the house, but yet hadn’t been audible before. The house, now painfully still except for the persistent click, click, click, a rhythmic lullaby. The change in atmosphere was palpable yet I remained glued to the computer screen, the inexplicable clicking noise matched only by my mouse clicks. A thought that didn’t seem to be mine, washed over and through me. Without much conscious realization of my actions, I flipped back a few pages to the Simons’ listings on the digital directory. My fog lifted. I saw it. With blood tingling in my veins, the knowing permeated my every inch. I picked up the photo to gaze into her face. As I did so, the click, click, click seemed to grow louder and pulled me from my chair. Still holding her picture, I walked to the kitchen. Our previously silent Hello Kitty now reached her tiny golden arm forward with every click. As she beckoned me closer, I shuddered. Somehow the intellectual verifications seemed trivial. I couldn’t suppress my reply. “Hello Mary Ann and thank you grandma,” I whispered back.